This years’ preseason is in the books for the Chicago Blackhawks. All in all, the Hawks went 2-4-0 in their exhibition matchups. To quote Patrick Kane. I think the biggest thing was coming in and having a good camp and I feel like we’ve done that even though our record isn’t that great in preseason. I feel like we’ve really had a productive camp, some good practices, some good trial runs in the scrimmages and things like that, so I think to kind of put an exclamation on that it’d be nice to have a good game tonight and feel good going into next week, feel good about practices and get a win under our belt here at home. This past week was a busy one, as the Hawks hosted three final preseason games at the United Center. Their final tilt Saturday resulted in a 4-1 win over the Columbus Blue Jackets, giving them a reason to feel good, as Kane referenced above. Numerous personnel moves were made throughout the week, and the opening night roster is finally in place. Let’s take a look at what’s transpired, and what we have to look forward to when the Hawks take on the Ottawa Senators this coming Thursday. Defenseman Brandon Davidson signed a one-year contract worth $650,000. After all these moves, the current roster consists of 13 forwards, nine defensemen, and three goaltenders. But, defensemen Connor Murphy (back injury) and Gustav Forsling (wrist surgery) will start the season on injured reserve. Netminder Corey Crawford is also expected to start the season on that list. He has not yet been cleared to play after dealing with concussion issues last season. This leaves 13 forwards, seven defensemen, and two goalies for a 22-man roster. A final roster may consist of 23 players, but head coach Joel Quenneville indicated from the start of the preseason he wanted to go with seven defensemen. This is a smart move, as rotating eight defenseman caused much frustration and lack of cohesiveness in an unsuccessful 2017-18 campaign. Utilizing 13 forwards instead of the usual 14 makes a lot of sense as well. 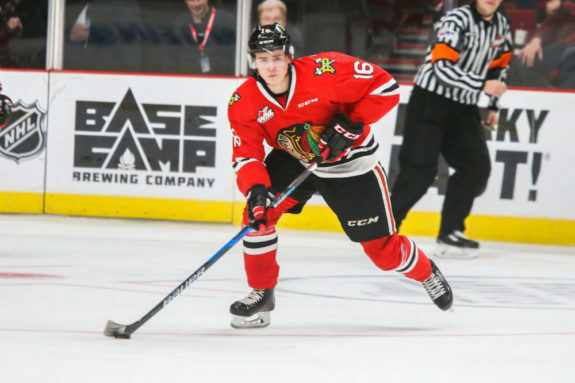 With so many young players in Chicago, as well as in Rockford, this gives the Hawks the opportunity for everyone to play instead of sitting in the press box for an extended amount of time. There will only be one healthy scratch every night instead of two, according to this set up. The odd man out will presumably rotate depending on performance and matchup issues with opponents. Saturday night’s game against the Blue Jackets was a good determiner of the opening night lineup. Here’s what was deployed, and what we will probably see for the first game on Oct. 4. Let’s break down the lineup even further based on what we’ve seen in the preseason. Toews’ production has seen a steady decline over the past three seasons — even having Saad back on his line last season didn’t do the trick. But who better to help a resurgence than the team’s top goal-scorer from last season, the young DeBrincat? Toews and DeBrincat have been together on the top line since the start of the preseason. They play off each other well, and DeBrincat has already provided the helpers for two of Toews’ three preseason goals. The third member of this trio comes as a bit of a surprise. Kahun started as a dark horse to make the team, but dominant performances have made him not only a lock, but a contributor on the top line. In his first two preseason games, Kahun impressed by notching a goal and two assists. For the final three exhibition tilts, he’s been on the top line and looks like he belongs. He added another goal against Detroit this past Tuesday, assisted by Toews and Keith. Has Saad Found His Spot? 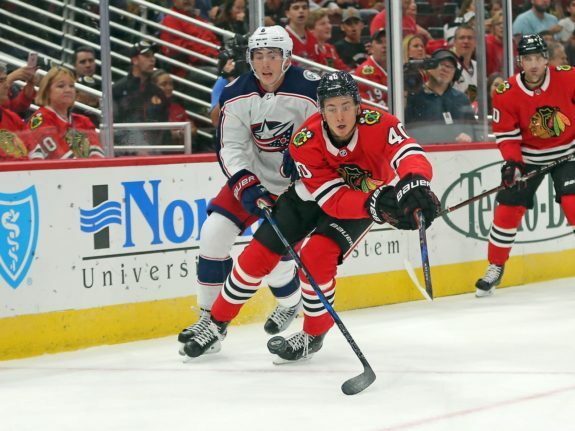 Saad started, as well as ended, his preseason time on the second line with Schmaltz and Kane. But for the fourth and fifth exhibition games, Coach Q experimented with a line of Schmaltz-Anisimov-Kane instead. While this line didn’t look all that bad, Saad struggled in the third line role he had been relegated to. Unfortunately, it’s quite obvious he doesn’t have the capacity to carry a line on his own and that he needs more skilled teammates to lead the way. Coach Q realized this and adjusted accordingly. Brandon Saad will skate with Schmaltz and Kane tonight vs. Columbus. Q: "We tried him on another line to see if there’s more balance that way. … But playing with Kaner and Schmaltzy, there’s a lot of speed, lot of possession. It puts him in a way better spot to be productive." Saad made his case even stronger to stay on the second line by notching a goal (assisted by Schmaltz) and creating a few other chances in this spot during Saturday’s win against Columbus. 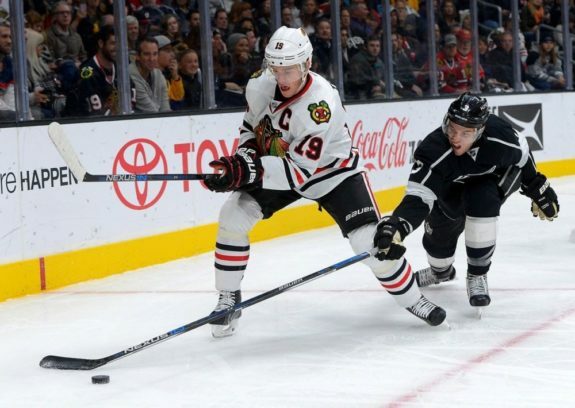 Related – Can Toews, Saad, & Keith Bounce Back? Remember last season when Hayden, Lance Bouma, and Tommy Wingels bonded and formed the “energy line”?! Well it looks like Hayden has found some new buddies to help him get the job done this year, namely Kruger and Martinsen. 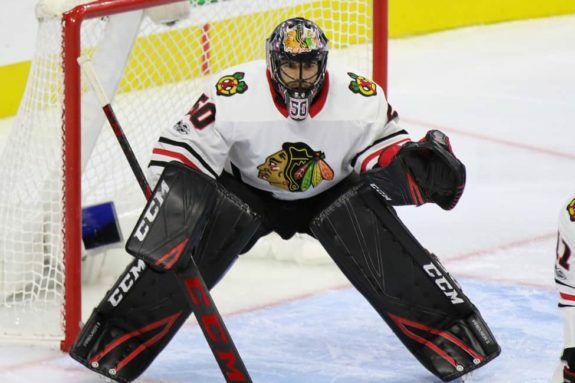 Kruger returns for his second stint with the Hawks. He’s picking up right where he left off by taking on defensive zone responsibilities and being consistent in the faceoff circle. Martinsen is doing his best to be hard to play against. In three games played, he’s recorded 14 hits. Even though it’s not particularly their job to score goals, all three players have found the back of the net in the preseason. It’s no secret headed into the regular season that this line could be a problem. While the other three lines are working together and making things happen, this line has seen a rotating cast of characters that haven’t found any cohesiveness. Obviously, Saad didn’t work out. Other players on this line have included Kunitz, Anisimov, Kampf, and Johnson. Anisimov, Kampf, and Johnson are all centers, so there are options down the middle. Expect a lot of experimentation here in the first few weeks of the season. And, of course, don’t be surprised if players are pulled off other lines and tried in this role to see if anything gels. Two players that could be helpful down the road in this capacity are Victor Ejdsell and Dylan Sikura. Both were sent down to Rockford, but have the skill and potential to help this team upon further development. It will be fun to keep an eye on their progress. I expect both of them to make an impact at some point with the big club. Referencing the defensive pairings above, Davidson slotted into the third pairing this past Saturday. Although Rutta played on the third pairing with Gustafsson against Ottawa in Thursday’s preseason game. He probably slots in ahead of Davidson on the depth chart. Davidson also has the flexibility to play on both the left and right side, and his possession numbers were strong throughout the preseason. I wouldn’t expect him to be sitting on the bench on a regular basis. Even with just seven defensemen, there should be a healthy rotation on the blue line. Keith and Jokiharju should be a fun pairing to watch. Jokiharju seems confident and willing to learn as much as possible from his veteran partner. But keep in mind that Jokiharju is young and could encounter some growing pains. Seabrook looks rejuvenated and ready to head into the grind of another season. Gustafsson has shown his offensive upside, and Manning has looked both hot and cold. While the third line might be the weak link on the offensive side, there’s been concern about the Blackhawks’ defense all last year and the entire offseason. All we can do is wait and see how it pans out. Crawford has been making some great strides while working with goaltender coach Jimmy Waite before the teams’ morning skates. He even took some shots from teammates in his last two sessions. 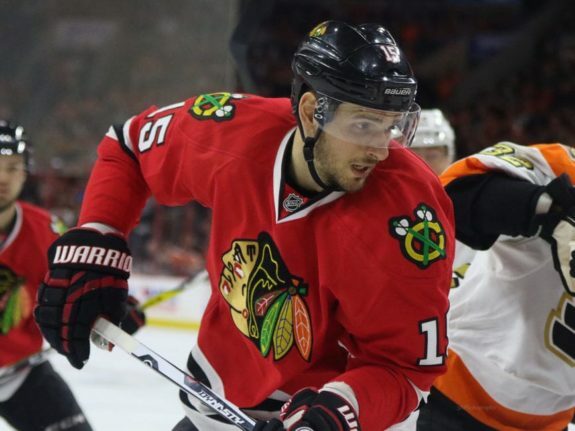 Coach Q indicated on Saturday that Crawford could possibly join his teammates as soon as Monday, or early this week. This is a very positive sign, but there is still no timetable for when he will be available to play in a game, or how good he will be after such a long and traumatic injury. In the meantime, the veteran Ward is expected to fill in until Crow is ready. Ward had a horrific outing last Tuesday again Detroit. He gave up six goals on 17 shots, with the first one going in just 16 seconds into the game. He was pulled at the end of the second period, and ended his night with a dismal .647 save percentage. Ward took the net again on Saturday against Columbus. He fared much better in that game, although he didn’t see much action. All in all, he stopped 16 of 17 shots for a .941 save percentage. Let’s hope this is the Ward we see moving forward. Forsberg is expected to be Ward’s backup. 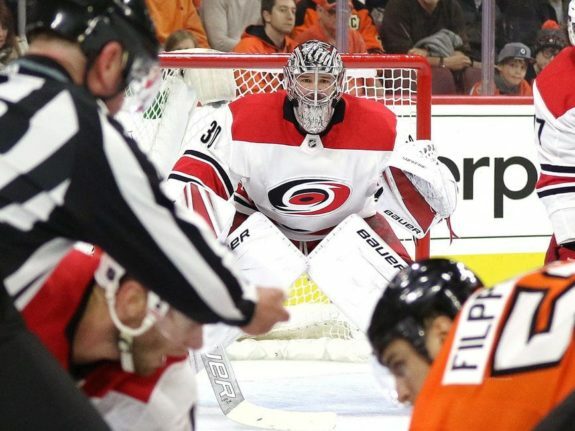 He suited up for half of the first two preseason tilts, the third period of Ward’s bad outing, and the entire game against Ottawa this past Thursday. His combined .866 save percentage doesn’t provide much optimism. He allowed seven goals altogether. A very busy and exciting preseason has led us to this point. Fans, coaches, and players alike are now looking forward to the real deal, which starts with a matchup against the Ottawa Senators this Thursday. Only time will tell how the season unfolds, but the Chicago Blackhawks are ready!